Do you remember when The Killers self-debut album Hot Fuss was released? The band caught on like wildfire, becoming one of the most popular bands of 2004. I loved this album and was addicted to it. The first 9 tracks were brilliant and the cd was hardly ever taken out of my car stereo. Because of my addiction to Hot Fuss I was very excited when Sam's Town was released in 2006. While there were great songs on this album I was disappointed that they moved away from their "dirty" sound; with less keyboards, electronic music, guitar, and replaced with a more generic sound. The Killers became an anomaly to me. While most bands become more complex the longer they play together Sam's Town and the B-Side album Sawdust indicated that the band's sound was becoming simpler. Some may appreciate this, but I missed the days of Hot Fuss. While listening to their new release Day & Age I was even more perplexed. The album was even simpler than Sam's Town. There is a lot of keyboard on the album, but very little bass and guitar. The sweet beats that I loved on Hot Fuss are completely gone. Maybe it is a good album, and my longing for their original sound prevents me from truly appreciating it. Brandon Flowers is a good singer. There is no doubt about this. However, his voice is the main contributor to The Killers evolution to a simpler sound. On Hot Fuss Flowers talked, sang, screamed, etc. But on Day & Age his voice is very straightforward and unchanging. I like keyboards. I don't like songs in which simple keyboard is the main instrument. 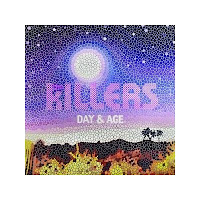 What happened to the guitar, bass and drums of The Killers? Again, maybe I'm just not appreciating it because I want something else. But the songs are too simple to score them high on creativity. While simple, there are still some really great melodies on this album. The production of the album is extremely clean. I like that they went a bit more off mode with this album. 'Human' is starting to get onmy nerve though.